“I’ve received my copy of a new book of sermons by Rev. David Petersen of Redeemer Lutheran Church in Fort Wayne, Indiana. The book is a new publication from Emmanuel Press. 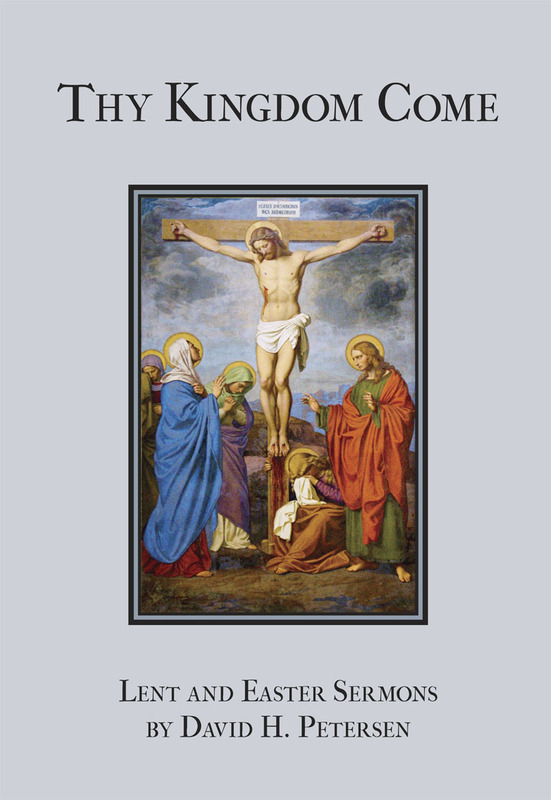 It is a nice sized paperback volume with a classic painting of the crucifixion on the cover. The kingdom of God comes by itself without our prayer, but it is clear as we learn from the preaching of the Word of God, it comes thereby to us for the delivery of forgiveness, life and salvation. We have in this selection of Pastor Petersen’s sermons during Lent and Easter (historic one-year lectionary) a glimpse both into the art of preaching and of pastoral care through such preaching. It is clear that these sermons are applications of the Word of God in its full counsel for the sake of the congregation, the feeding of the sheep, and their repentance toward trust in Christ, the Good Shepherd who laid down His life for the sheep. Pastor Petersen gets himself out of the way to be a mouthpiece of the Lord’s gracious voice. His sermons are concise in a way that reminds one of Peter Chrysologous, the Doctor of Homilies. In this respect, I commend this book of sermons for pastors to hone the art of purposeful and exegetically grounded preaching. I have much I can learn from David Petersen in this way. He is a seasoned pastor and spiritual father to the congregation. Redeemer in Fort Wayne is often noted to be one of the ‘most liturgical’ congregations in the Missouri Synod. But it is clearly the case that Redeemer enjoys the gift of good preaching as well as reverent Divine Services. It is helpful for pastors to read the sermons of other faithful pastors to break free their own style and usual vocabulary to express the unchanging faith. Pastor Petersen gives much in the way of a model for both new and experienced pastors who want to deliver a sound proclamation of Christ into our postmodern context. For the laity, sermons are most always good devotional material to read (such as those of Luther or Johann Gerhard, or more recently those of Norman Nagel). I would certainly commend Thy Kingdom Come as reading for Lutheran laity who wish to have additional good devotional reading to supplement their prayers and reading of Scripture or perhaps in the context of using the daily office at home (Matins, Vespers et al). While Pastor Petersen’s sermons are meaty and substantive, they are also very accessible, and most of them are brief enough for a brief gathering of the family for prayer and catechesis.